haven’t been answered yet please hold on to yours! asking at once, it gets kinda crazy! thanks! a BS with Highest Honors in Chemistry from UCLA. the behavior of atoms and molecules. top students throughout the nation. ballet dancer and award-winning mathematician. rest of us put together” and left it at that? galaxies? Creating them? or just manipulation of what is out there? ALI HERMES: Isn’t 1000 years a bit hard to predict? a lot more than we are now. consider those days barbaric and now civilized. the human race in our brain. Life already? This is fun! when I want to put science in the books. CatherineAsaro Skytower: I’m convinced we have a future in space. CatherineAsaro Skytower: Taellinu, I suspect through a breakthrough. speed of light. but it was only math. from the cosmic ray flux. see as likely develoments in those fields? our “machines” is more like it, I think. We’re already in the preliminary stages. make moeny and what wont? Sophrosyne Stenvaag: isenhand, is there a difference? isenhand Nightfire: so, our money based sociaty limits what we can do? have colonies on the moon? CatherineAsaro Skytower: Carolyhn, yes, military applications, too. Dynasty princes. He is a singer. stand his singing. Then he’s taken to Earth as a prisoner. Man, you are the best rock singer I’ve ever heard. Rock didn’t exist on his home world. wrote while I was writing the book. how to order the full CD. communist, or something else entirely? democratic. but they aren’t powerless, either. 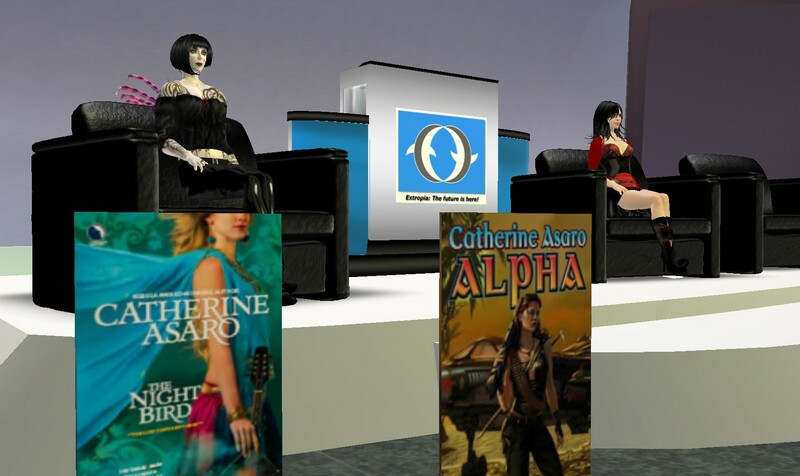 CatherineAsaro Skytower: Technology and power are closely related, yes. out there DO turn out to be Hostile? That’s actually a problem in writing SF. think it would be that interesting of a story. Writing SF, and a Skolian Sim? HYPATIA PICKENS: That’s always been a problem writing sf. future? whether near or far? extrapolations affect us as humans. Ultimately it speaks to who and what we are now. and also to prod them to think. your stuff down to print it……..
an avatar of Soz would be like? Wow. CatherineAsaro Skytower: We could do a Ruby Dynasty sim. What Do You Think of SL? but what do you think of our world? much of my already limited time here. me I was aging backward. Carolhyn Wijaya: Do avatars dream of sculptie sheep? CatherineAsaro Skytower: You’re lucky I’m not drinking coffee. But hooboy, I don’t want spam in my brain. Yeeech. Thanks everyone for coming;. This was great. Sophrosyne Stenvaag: And on *that* resounding note….! should all do it again. CatherineAsaro Skytower: It’s such a great group. Galatea Gynoid: Thank you very much. Extropia DaSilva: Soph, you MUST invite her back. Rodford Steinbeck: Yes Soph, please do! CatherineAsaro Skytower: I’d be happy to come back. 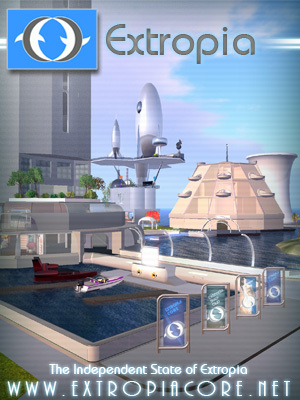 Extropia is a virtual-worlds community whose members share a common desire to build a positive, beautiful, empowering future for all. The Board of Directors of Extropia espouses no ideology beyond a belief that humanity’s future can be improved through its own ingenuity. 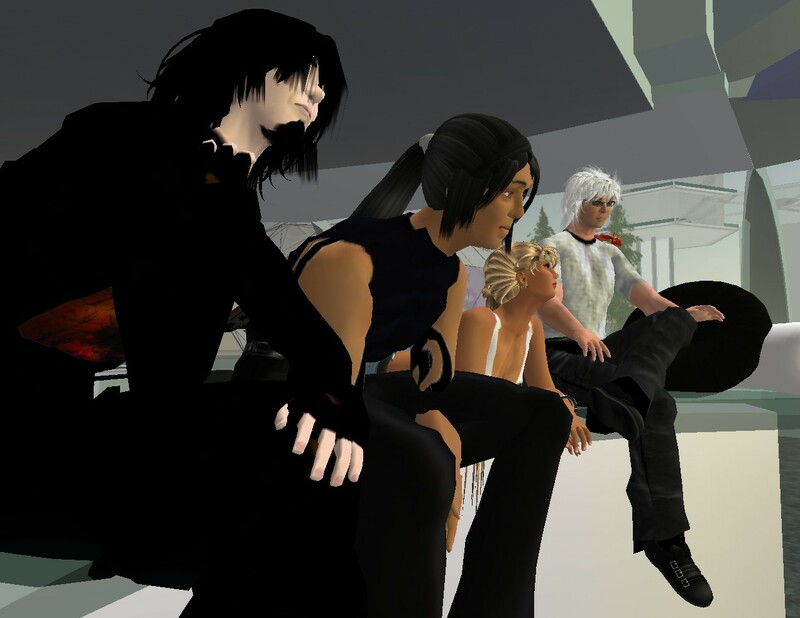 Extropia actively networks with other persons, organizations and communities in virtual worlds which share that belief. We host a number of events every week, in addition to having social hangout spaces where you can usually find people to chat with. We’re home to several organizations, numerous businesses both small and large, and have an active and growing residential community. We welcome visitors and commercial inquiries at any time!